The Rosco SubFloor is the perfect solution for studios owners that rent their space and do not want to invest in a permanent floor. 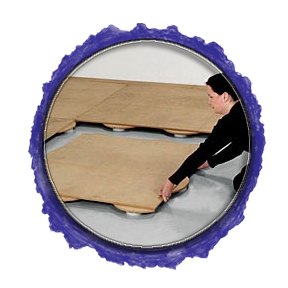 With the Rosco SubFloor you can install your own floor, and if you need to move or expand your studio, you can pick up your floor and take it with you. Most users will be able to install the Rosco SubFloor on their own. The 42" x 42" (3.5 ft. x 3.5 ft.) x 2" tall panels lock into each other with the unique and patented Wavelock panel interface. Panels weigh only 45 pounds each. The Rosco SubFloor can be installed using their own special perimeter pieces, 4 3/8" wide that lock the entire floor together. The perimeter can be secured to concrete or wooden floors, or left unattached without damaging the existing floor, and can be removed and re-used in if you need to move your studio, or if you need a temporary floor. Using the Rosco SubFloor Perimeter pieces the floor can be constructed in 3' 6" increments allowing additional space, (c. 9") for perimeter. Requiring a little more work, the Rosco SubFloor Customizing Panels allow installation of any size or configuration to create a custom floor for wall-to-wall installation. When using the Customizing Panels, you will need to provide MDF or the equivalent to cover all customizing panels. We do offer installation services and can customize a solution to save you money. For touring and panel transportation, storage carts are also available. If moisture is a concern, we can even customize the floor using Moisture Resistant materials.